With Serial to Ethernet Connector for Linux it is possible to share serial ports, either real or virtual, over Internet or Ethernet. The devices connected to the shared serial ports can be accessed from remote computers (clients) and the data that those devices transfer can be received through TCP/IP network thanks to Serial to Ethernet Connector.So how does it work? To be able to receive data from the device connected to a remote computer, "client-server" architecture is used. Serial to Ethernet Connector is installed on all machines that participate in data exchange. "Server" is a computer where serial port is shared; "clients" are all other computers that use device connected to the shared serial port. 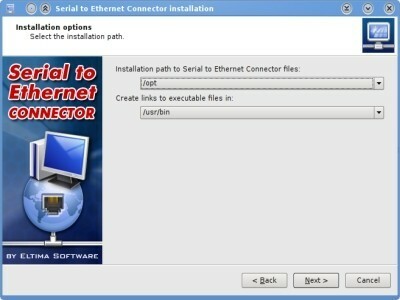 It is also possible to use Serial to Ethernet Connector as a "client" only. In this case it will receive the data sent by a COM-port device over the network. If you are using UDP protocol, Serial to Ethernet Connector for Linux can broadcast all serial data over your local network. Note, that there is Serial to Ethernet Connector for Windows OS too. One of Linux version's advantages is that it works with Windows version directly. Therefore, you can organize data transfers among Linux and Windows machines at a time. Any of them can be a client as well as a server. Serial to Ethernet Connector for Linux is a command-line software; to make your work with it easier it features extensive documentation with samples. There is also OEM version available, which allows integrating Serial to Ethernet functionality into your software.